The 010226 TUTCO SUREHEAT SERIES I AIR HEATER ELEMENT is made for 1050 watts of power, a maximum voltage of 180, and a maximum controllable air temperature of 1600 deg F.
The 014372 TUTCO SUREHEAT SERIES I AIR HEATER ELEMENT is made for 1000 watts of power, a maximum voltage of 130, and a maximum controllable air temperature of 1600 deg F.
The 014682 TUTCO SUREHEAT SERIES I AIR HEATER ELEMENT is made for 680 watts of power, a maximum voltage of 145, and a maximum controllable air temperature of 1600 deg F.
The 014683 TUTCO SUREHEAT SERIES I AIR HEATER ELEMENT is made for 650 watts of power, a maximum voltage of 105, and a maximum controllable air temperature of 1600 deg F.
The 015509 TUTCO SUREHEAT Series I Hot Air Heater Element Stainless Steel Outer Shield--open Ended. The 016501 (F016501) TUTCO SUREHEAT SERIES II AIR HEATER ELEMENT is made for 1125 watts of power, a maximum voltage of 130, and a maximum controllable air temperature of 1600 deg F.
The 016502 (F016502) TUTCO SUREHEAT SERIES II AIR HEATER ELEMENT is made for 600 watts of power, a maximum voltage of 95, and a maximum controllable air temperature of 1600 deg F.
The 016503 (F016503) TUTCO SUREHEAT SERIES II AIR HEATER ELEMENT is made for 850 watts of power, a maximum voltage of 80, and a maximum controllable air temperature of 1600 deg F.
The 016504 (F016504) TUTCO SUREHEAT SERIES II AIR HEATER ELEMENT is made for 650 watts of power, a maximum voltage of 70, and a maximum controllable air temperature of 1600 deg F.
The 017558 (F017558) TUTCO SUREHEAT SERIES III AIR HEATER ELEMENT is made for 2050 watts of power, a maximum voltage of 160, and a maximum controllable air temperature of 1600 deg F. This TUTCO SUREHEAT heater has an A style open-ended quartz tube housing. The Series III air heater has a 6.88" TUBE LENGTH and a 0.59" TUBE outside diameter. The maximum air pressure for this hot air heater is 7 psi. The maximum inlet temperature for this TUTCO SUREHEAT heater is 120 deg F, and the recommended air flow for this heater is 1 SCFM (or 60 SCFH). The 017575 (F017575) TUTCO SUREHEAT SERIES III AIR HEATER ELEMENT is made for 1450 watts of power, a maximum voltage of 135, and a maximum controllable air temperature of 1600 deg F.
017853 (F017853) TUTCO SUREHEAT Hot Air Heater Series II Stainless Steel Outer Shield--open Ended Accessory. 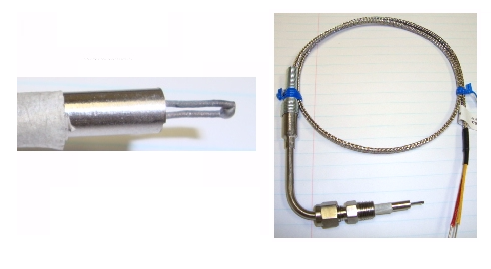 The 029485 (F029485) is a thermocouple holder for the TUTCO SUREHEAT Serpentine II hot air heaters. The 029765 TUTCO SUREHEAT air heater provides a maximum process heat of 1400 degrees F with 2,000 watts at 240 volt power and a maximum of 8 amps. This TUTCO SUREHEAT heater has an overall length of 8.20" long with a 0.63" outside diameter. This 029766 Serpentine II hot air heater provides a maximum process heat of 1400 degrees F by providing 2,800 watts at 240 volt power and 12 max. amps. The heater is 8.20" long with a 0.63" outside diameter. This 029767 TUTCO SUREHEAT hot air heater provides a maximum process heat of 1400 degrees F by providing 3,600 watts at 240 volt power and 15 max. amps. The heater is 8.20" long with a 0.63" outside diameter. 038821 TUTCO SUREHEAT threaded inline heater is a Style A design that should be used whenever an absolute leak-proof system up to 150 psi (10 bar) is required. The 038822 TUTCO SUREHEAT threaded inline heater is a Style B design which will have slight air leakage through the power wire strands, and it can handle up to 150 psi (10 bar). 038823 TUTCO SUREHEAT threaded inline heater is a Style A design that should be used whenever an absolute leak-proof system up to 150 psi (10 bar) is required. The 038824 TUTCO SUREHEAT threaded inline heater is a Style B design which will have slight air leakage through the power wire strands, and it can handle up to 150 psi (10 bar). 038825 TUTCO SUREHEAT threaded inline heater is a Style A design that should be used whenever an absolute leak-proof system up to 150 psi (10 bar) is required. 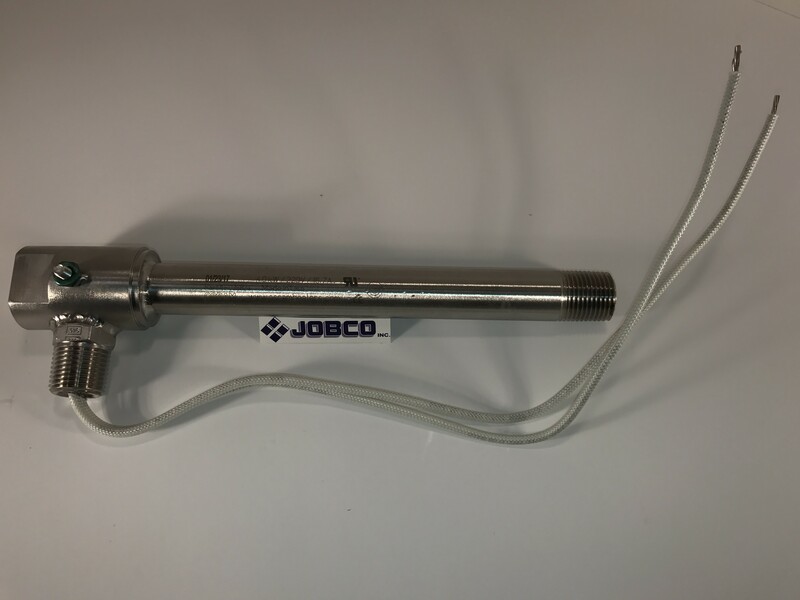 This threaded inline hot air heater is designed for high pressure air applications needing a 1.25" NPT sized heater. This hot air heater provides a maximum process heat of 1400 degrees F by providing 6000 maximum watts at 220 volt power and 27.3 max. amps. The 038826 TUTCO SUREHEAT threaded inline heater is a Style B design which will have slight air leakage through the power wire strands, and it can handle up to 150 psi (10 bar).